So, I have these vintage sewing patterns. 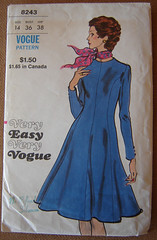 I posted a mention over at Leahpeah’s blog, and Leah said she’s interested in a couple of the Vogue patterns. Then Andrea emailed me and said she was interested… so I took pictures of the rest of them and offered them to her. And she’s claimed a couple. The rest are up for grabs. They will be mailed to you at no charge. I do not want payment. I think they are only worth a couple of dollars and mostly I want to make sure they go to someone who will use them. I would ask that in return, you send a photo of the finished product you create…. I imagined myself wearing this dress dashing around the streets of Paris…. on my way to an important meeting. To meet an important man. In reality, I wandered Paris with my sister. displays a certain joi d’vivre. So I’m offering them here to you, dear readers. If you’d like to claim one or more, Contact Me. First come, first served. 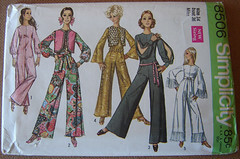 You can see all the vintage sewing pattern photos at Flickr. I’ve noted “Claimed by…” in the photo description.